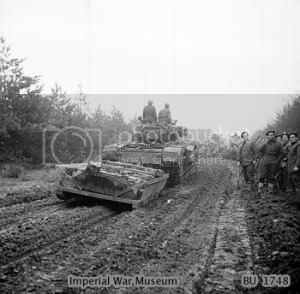 During World War II the 79th Armoured Division were issued with drop-sided sledges for use with their Churchill AVRE’s and these were used successfully in the North West European campaign. The sledges were designed to carry spare faggots for the fascine carrier, but could also be used to transport general stores and ammunition. Both the Churchill AVRE Mk III and Mk IV conversions were used by the Division on the D Day assault on the Normandy beaches and both types of vehicle could be used to tow the AVRE sledge. Also used was the Porpoise sledge. Following the success of these sledges, further trials and developments took place with the ‘Gutter Carrier’, but that’s another story. The sledge was designed to carry stores, spare faggots and, for those brave enough to ride in it, troops!! It had a moderate degree of protection with 7mm thick armoured front and sides. The base of the sledge was made of a planked wooden deck to which were attached two long wooden skids. Accurate Armour produce both the AVRE Sledge Kit No A033 and the Porpoise Sledge Kit No A004, with this being a brief look at the former. The kit comes packed in a study thick plastic bag secured with the Accurate Armour folded label detailing the product details on the front, and the company contact information on the reverse. Included in the set is a 4 page A5 instruction sheet, covering safety, general instructions, build diagram for the Sledge, and Tow-bar and Mounting build diagrams. The kit is cast in a dark grey resin and consists of 4 major parts along with 2 sections of additional fittings, plus some thread and brass rod for the towing bars. The detail is sharp and I could see no sign of damage or air bubbles to the kit. The base of the sledge is detailed both top and bottom, and should require only minimal clean up. The two sides are nicely cast with good detail, as is the front panel. A sharp razor saw or No 11 X-Acto blade will be needed to remove the plugs. No rear panels were fitted to the sledge. The sledge can be built with the sides up carrying a load, folded for transport, or fully down for unloading, so an early decision is required as to the final setting. The kit parts are numbered and correspond to the diagram, so the build should be a very straightforward event. Parts J, the fixings for the rear stays, are very small so care will need to be taken when removing them from the plug as will handling parts E, the stays themselves, and part H the front armour stays. Also provided is the communication rope which ran from the tank cupola back to the sledge, although I’m not sure many would have chosen to ride in this....but who knows!! This appears to be an excellent representation of the Churchill AVRE Sledge. It’s not a must have item, but will add scope and interest to any AVRE build you might choose to do. It could equally be used as a stand alone item to add interest in a diorama. The sledge itself is well detailed and should paint up very well. Options are available for a choice of finish and that is always a good thing. Load up your faggots, stores, ammo or troops, and away you go. Use is only limited by imagination and it wouldn’t necessarily have to be a Churchill AVRE it was attached to, so more options there if you think on it. Highs: A very useful vehicle/diorama accessory, that will add some additional interest to your build/scene. Very nicely cast and detailed. Verdict: Not a must have item but a very useful one. Highly Recommended.